face painting, balloon art, or glitter tattoos! Our standard 2-hour Theme parties also include plenty of time for eating snacks, serving and eating cake, and opening gifts! Choose any two activities from the following list to customize your standard theme party plan! Dress Up! Robin's dress up collection includes choices for both boys and girls from size 2T - 10, and enough for more than 20 kids at a time! Robin carefully curates a selection for each party, to make sure there are plenty of choices for all the kids to choose from! Makes lots of fun photo opportunities! Dance Lessons by Snoqualmie Studios (ballet, hip hop, tap, ballroom etc.!) A dance lesson can be a fun addition to all kinds of party themes! How about fairy ballet, or princess ballroom dancing, or hip hop dancing pirates? Themed Party Craft! We have lots of options for ages 3-12+. Talk to us about your specific party theme and the age of the kids attending, and we will suggest some options for you and your child to choose from! 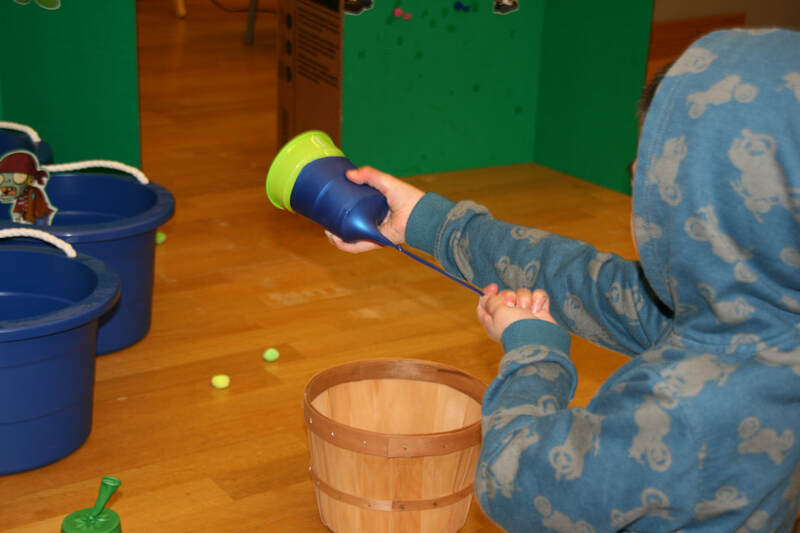 Depending on the theme and your preferences, we can bring an assortment of fun carnival-style games like bean bag toss, ball toss, sticky darts, peashooter (pictured!) and more! Or if organized games are more your style, we can lead the kids in playing limbo, silly relay races, circle games, and more. Storytime! As an experienced dramatic reader, Robin can read your child's favorite story, a passage from a favorite book, A fun book that matches the party theme, or (for an additional fee) she can even make up a new story just for your child and their friends! Stories are always performed with goofy voices, lots of drama and audience participation! Lots of fun especially for ages 2-8. Toddler and preschoolers only: Inflatable ball pit, play tents, and toys! Kids under the age of 5 are generally too young to enjoy many organized activities, so instead we have lots of balloons, an inflatable ball pit, and lots of fun toys to keep them busy! For 3-4 year olds, simple crafts or dress-up are also options! For parties for preschoolers, we strongly recommend each child have a parent present enjoying the party with them. All toddler (age 1-2) party packages also include a decorated high chair for the birthday child at no additional cost! Looking to make your party even more fabulous? Check out our optional Party Add-Ons!